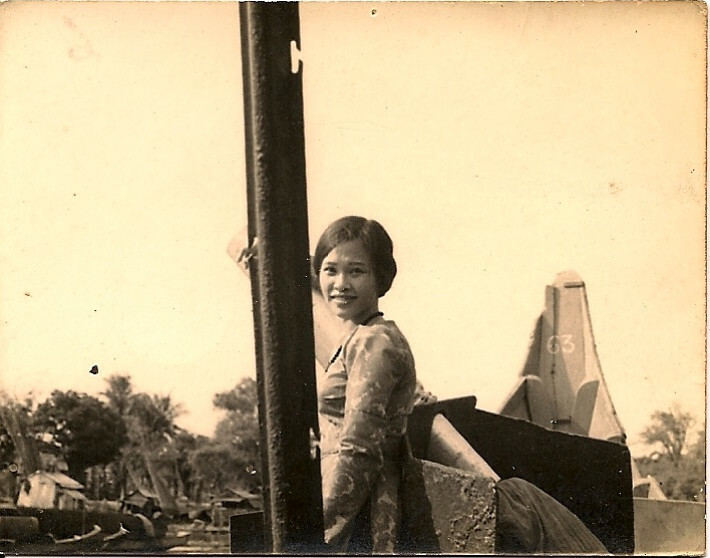 Friends, today is the beginning of Tết – the Vietnamese Lunar New Year! As with every new year, I’ve done all the rituals like scrubbed down the house, prepared an altar of traditional Tết goodies and went to the bank to get crisp “new money” to stuff all the bags of lì xì for the munchkins. 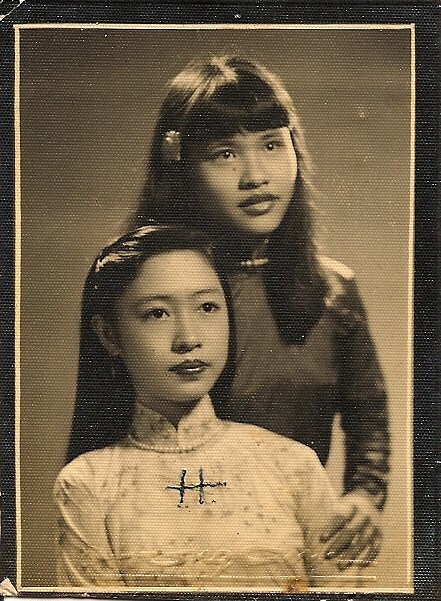 Man…I miss the good ol’ days when I was the one collecting stacks of lì xì. Now, Cô Nam just doles out the red envelopes. Being a grown up is seriously overrated. But at least there’s still all the good food! Every year I look forward to eating copious amounts of fried Bánh Tét with Dưa Món. 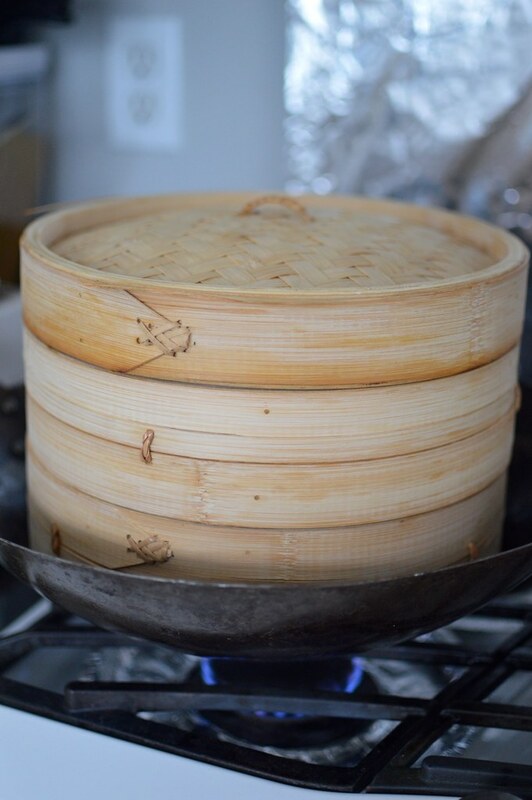 Bánh Tét are steamed sticky rice cakes and are cylindrical in shape. 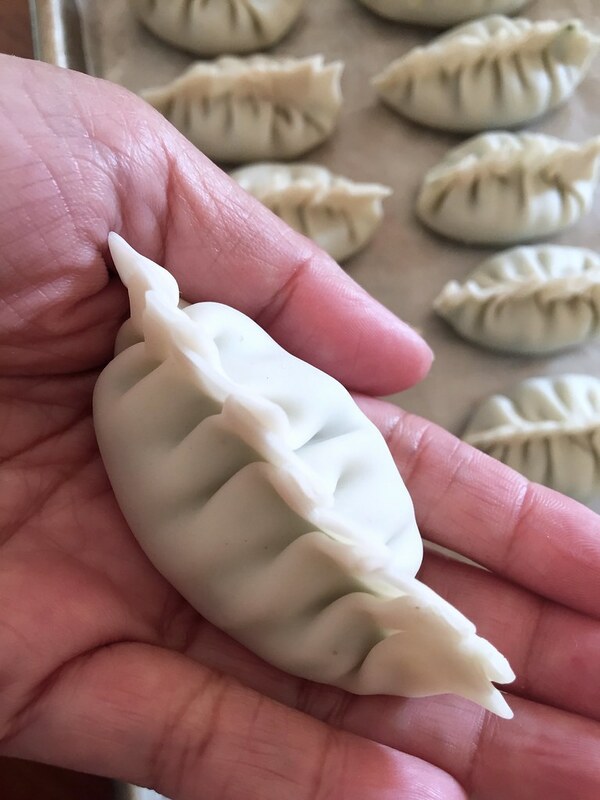 Bánh Chưng are essentially the same but are shaped as squares. 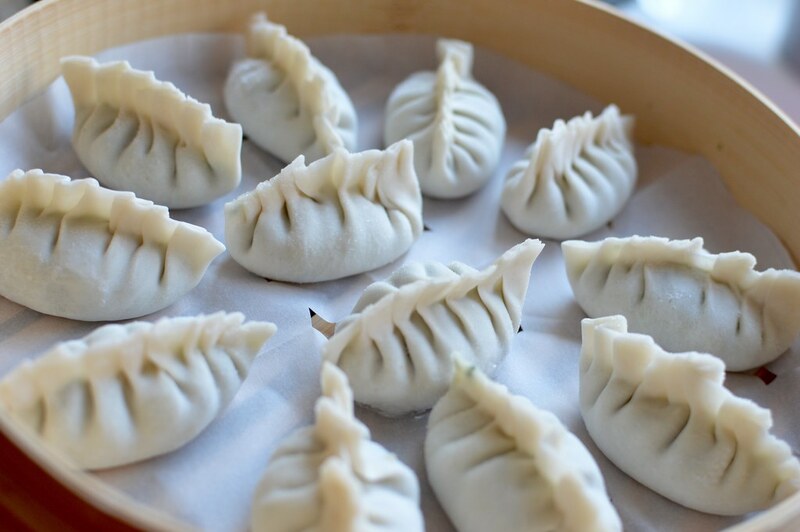 The savory ones are filled with pork belly and mung beans. 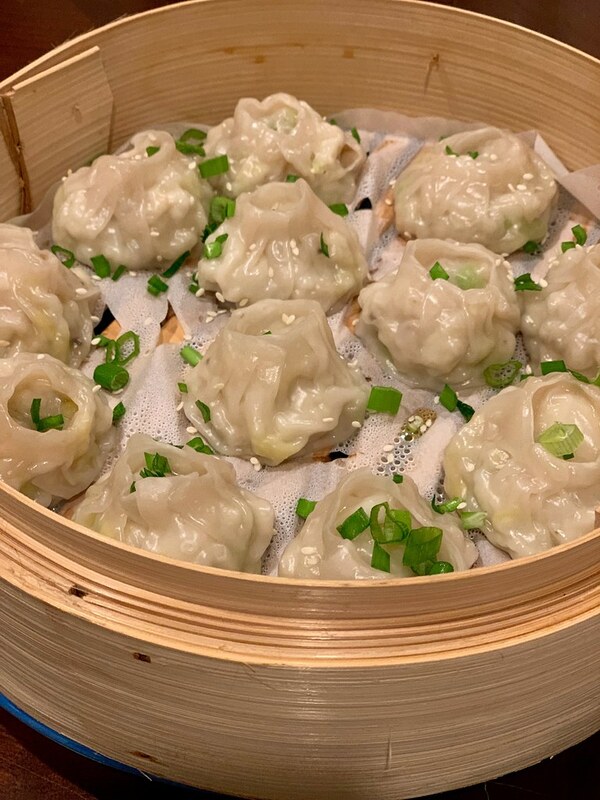 Although they can be eaten just as is, I prefer it fried so the crust is nice and crispy but the interior is still soft. SOOOOO good! And of course, it’s best eaten with a side of Dưa Món – pickled veggies. 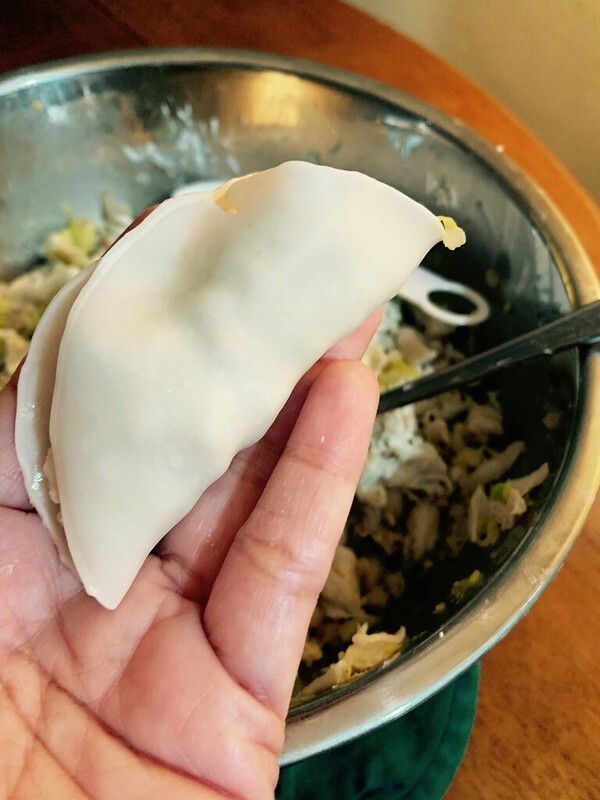 Bánh Tét/Bánh Chưng are not something my family make—well, at least not since I’ve been alive! 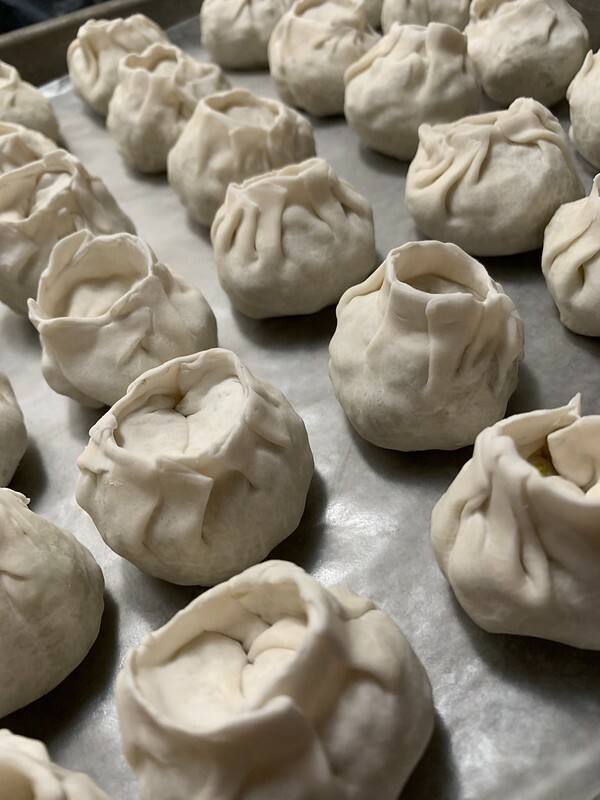 It’s REALLY a time consuming process and it’s one of those things that if you’re going to go through the efforts to make a few, you might as well make 100. But that would take you foh-evah! 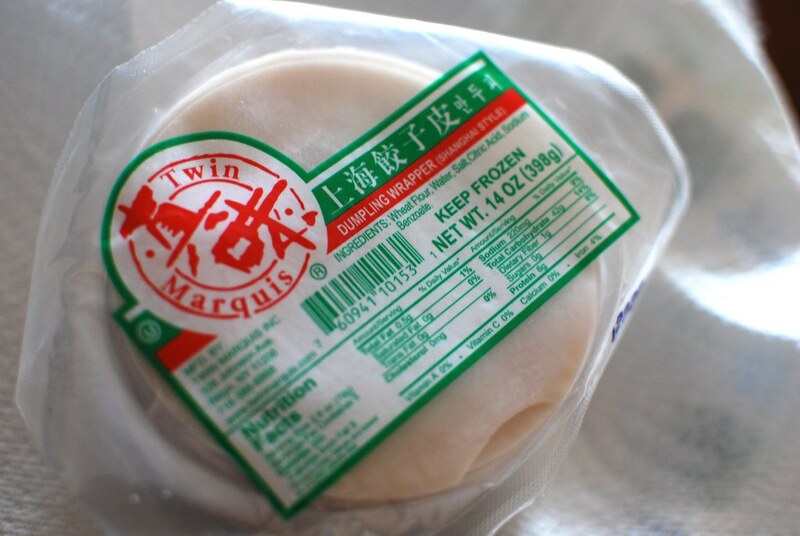 So like most Vietnamese folks nowadays, we buy ours. But we still like to cook other traditional Tết dishes. 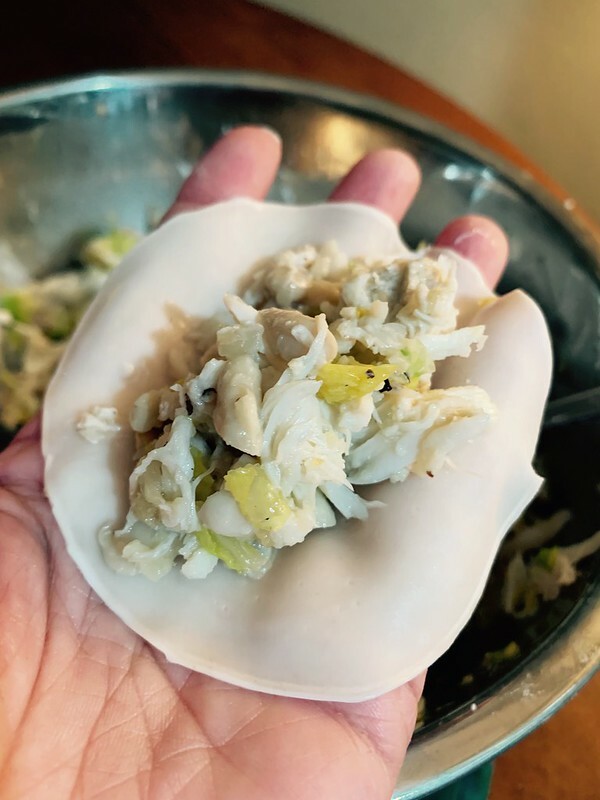 But as I’ve gotten older, I’ve started to include some dishes in my yearly rituals that we didn’t grow up eating for Tết. 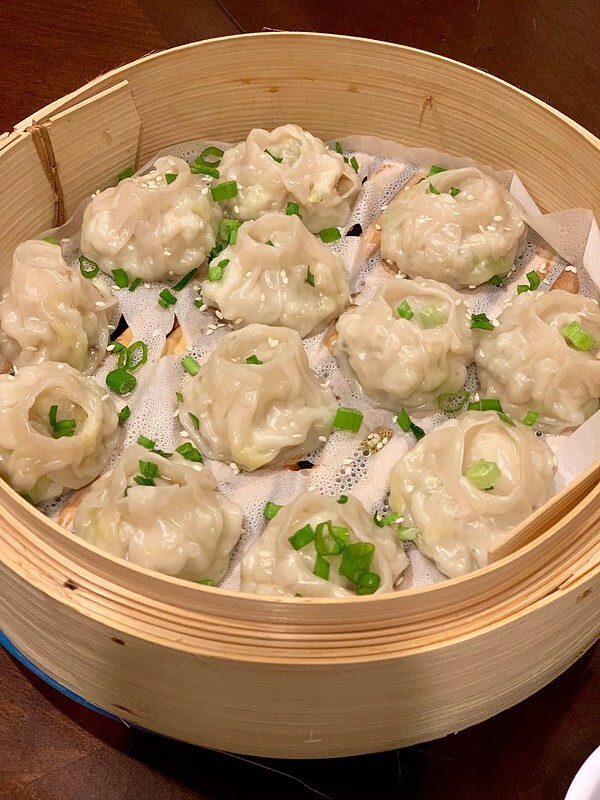 And dumplings definitely top that list! 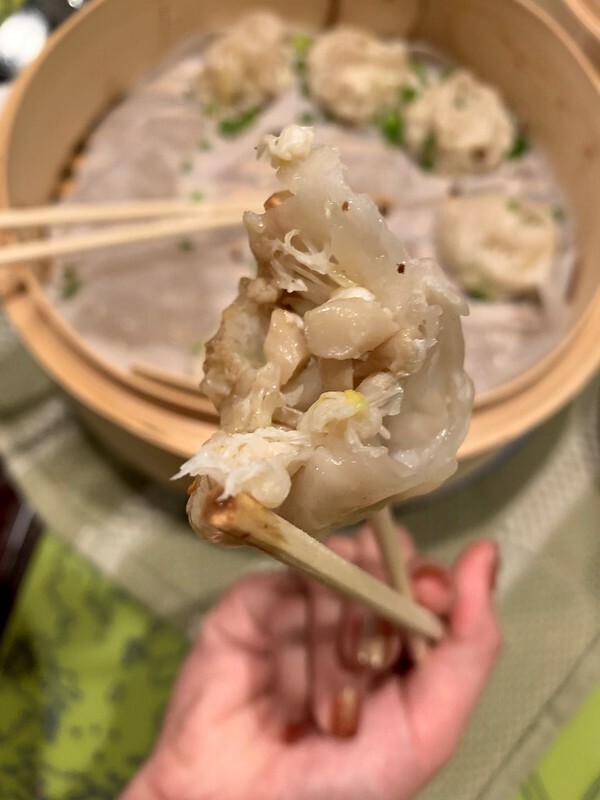 Sure, our Chinese kin definitely prepare and eat a variety of dumplings as a part of their Lunar New Year traditions. They’re eaten for luck because they symbolize wealth and richness as their shape resembles Chinese gold ingots. 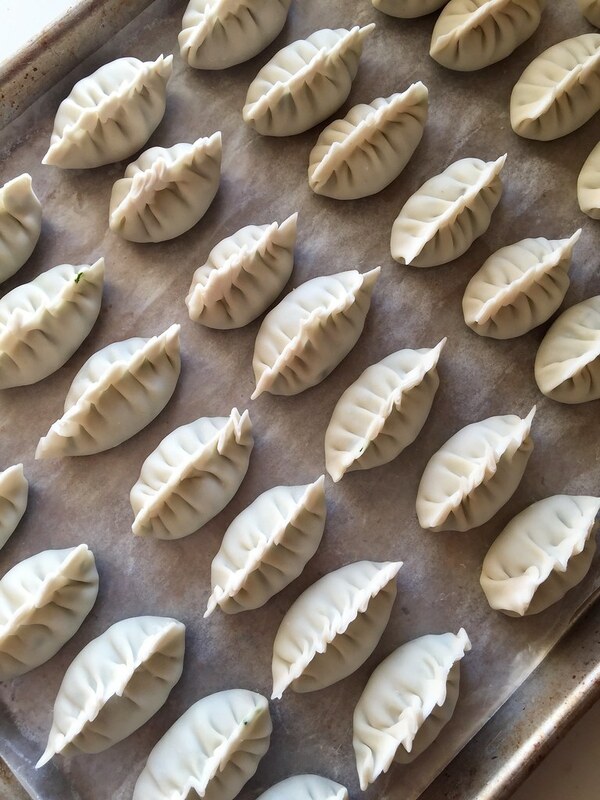 But hey–if it can bring luck and taste delicious, why not adopt the practice, right? 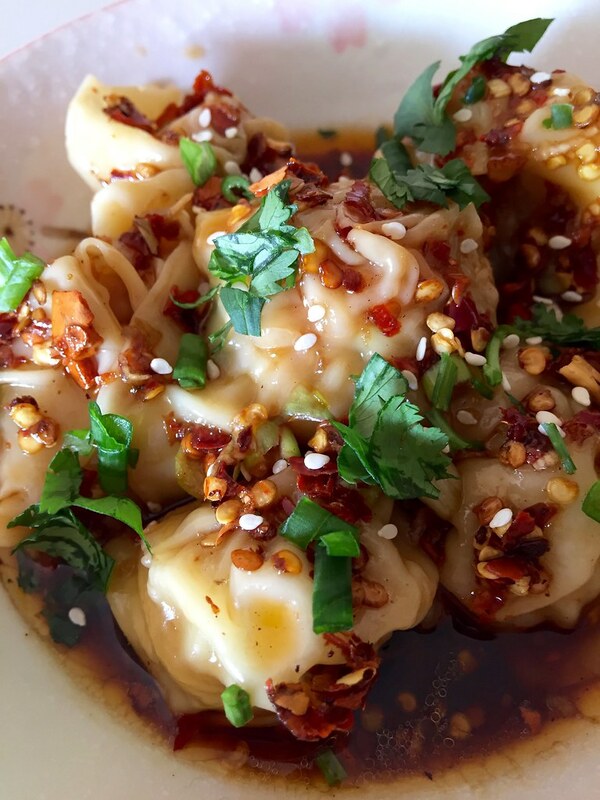 But for this year’s Tết, I thought I would share with you my Sichuan Wontons with Chili Oil Sauce. They. Are. So. Dang. Tasty. 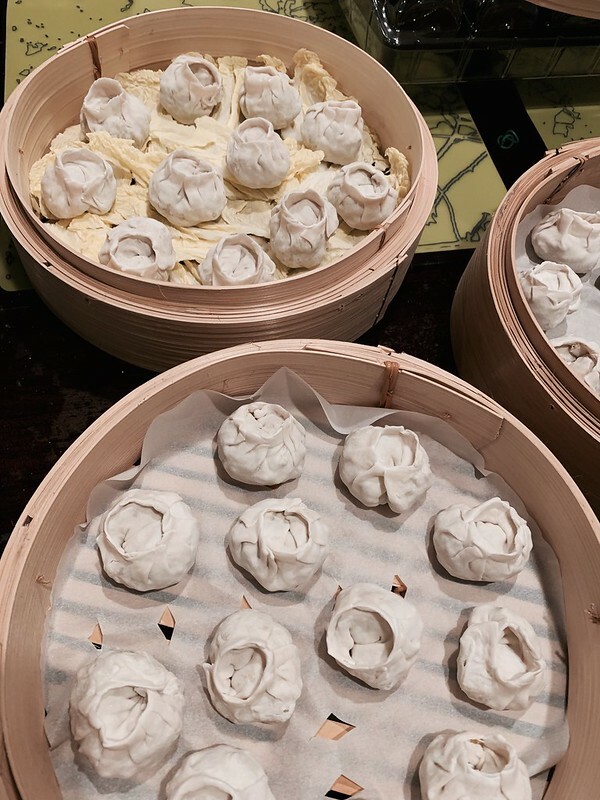 But what’s the difference between a dumpling and a wonton? Honestly I’ve found that the answer changes depending on the person you’ve asked. 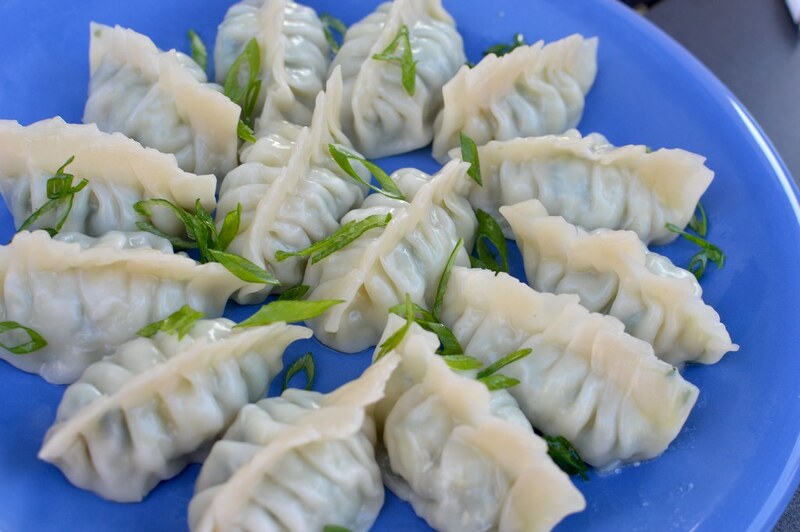 But generally folks tell me that dumplings are often quite plump and are steamed or pan-fried. 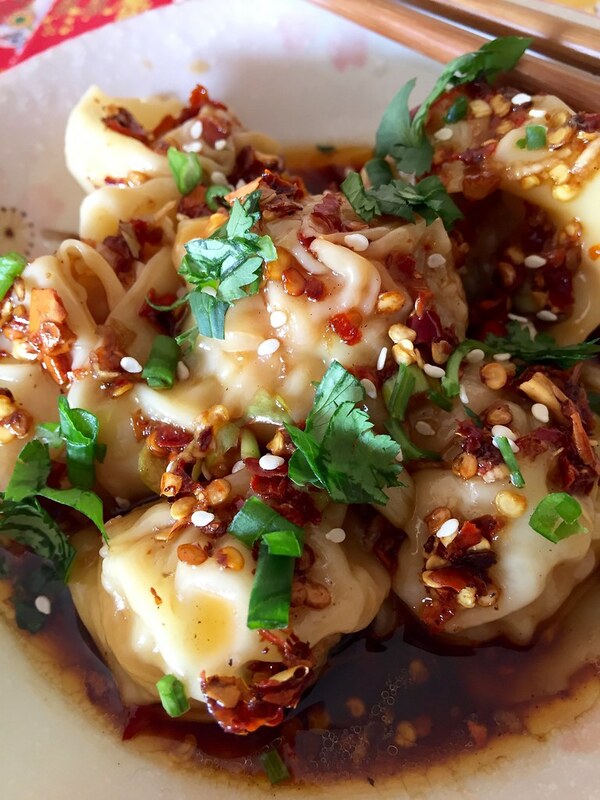 Wontons are most often boiled and served in soups or a broth. 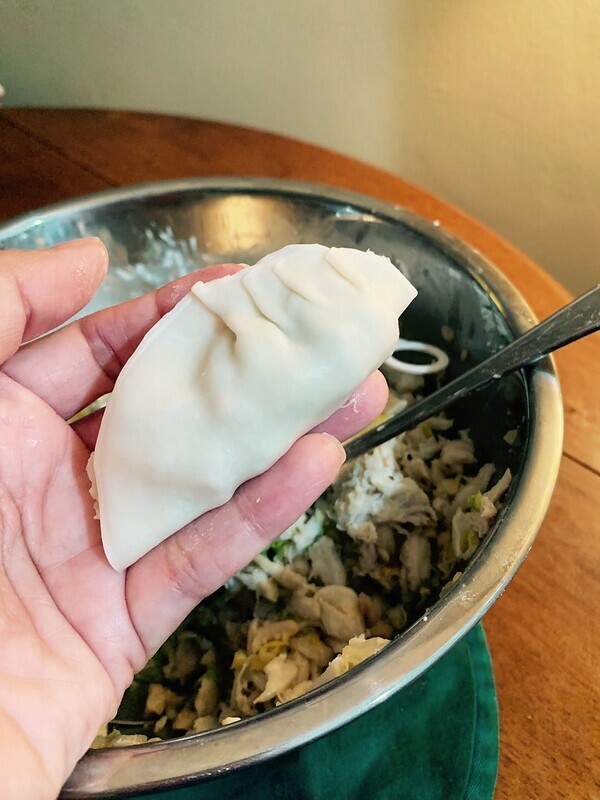 The wrappers (or skins) are also supposed to be really thin and since they aren’t filled as much as the former, it allows the soup/broth/sauce to stick to the excess dough. That way, you can just slurp them up! 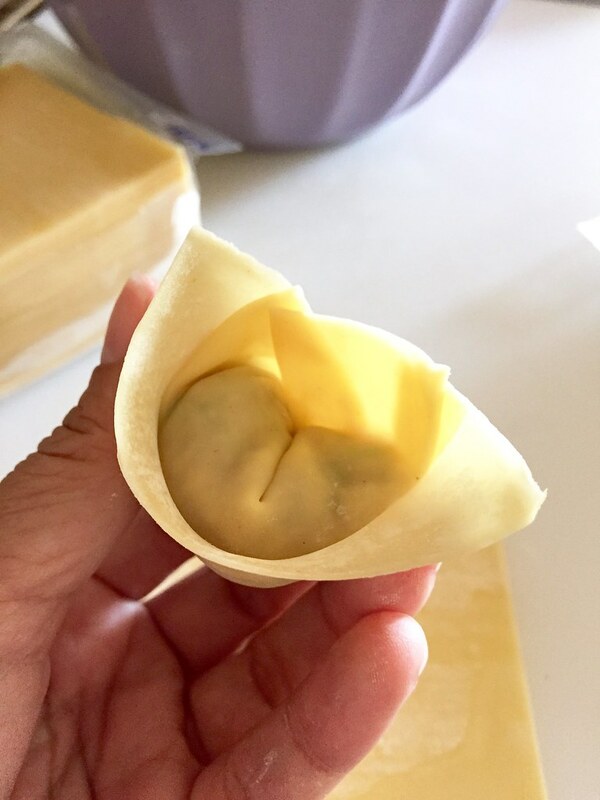 Oh…and some say that wontons only use square wrappers and dumplings use a round shape. But really… you can call them whatever you want —because I’ll take ANY version of them. 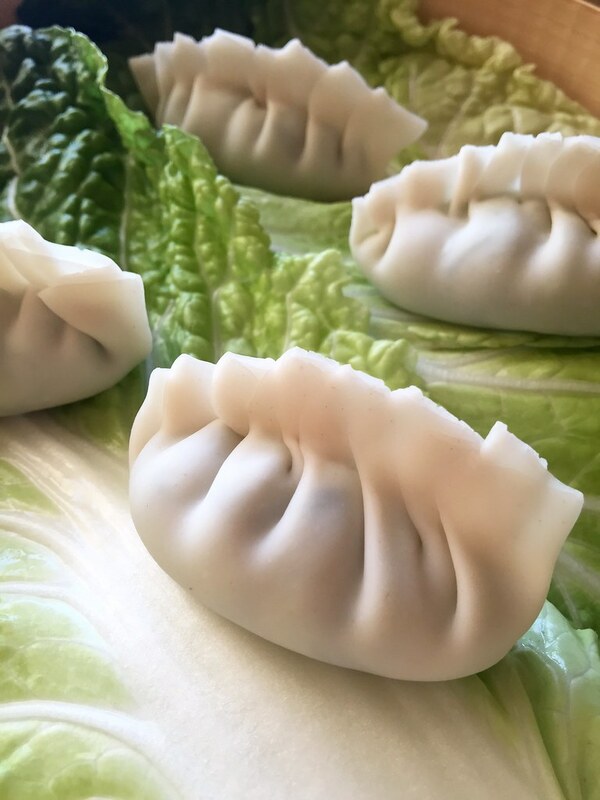 These Sichuan Wontons are filled with a 1:1 ratio of pork to shrimp. 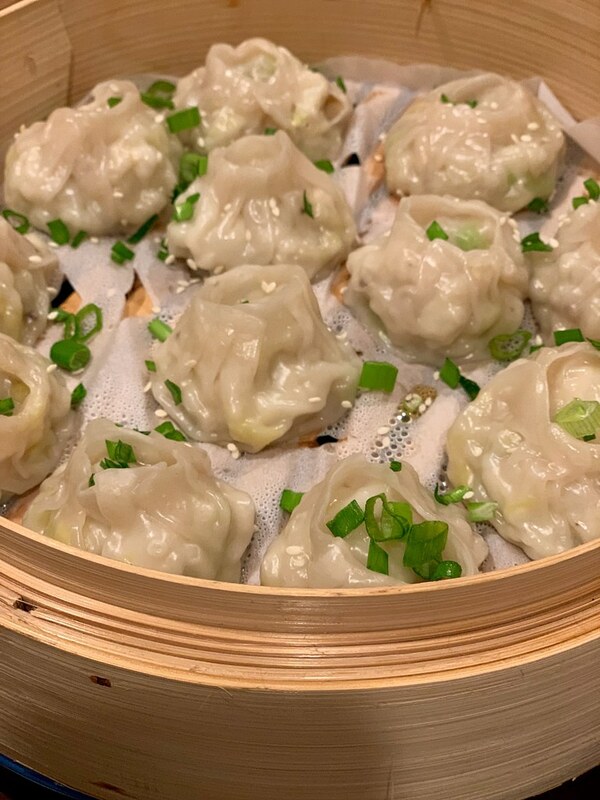 And unlike my other dumplings, I don’t add much filler other than aromatics. 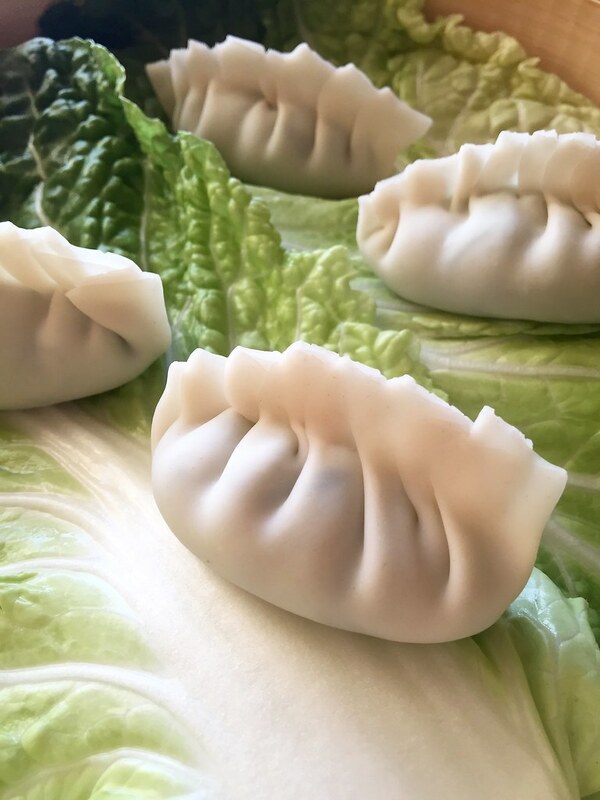 No cabbage, no mushrooms—just protein and few other things. 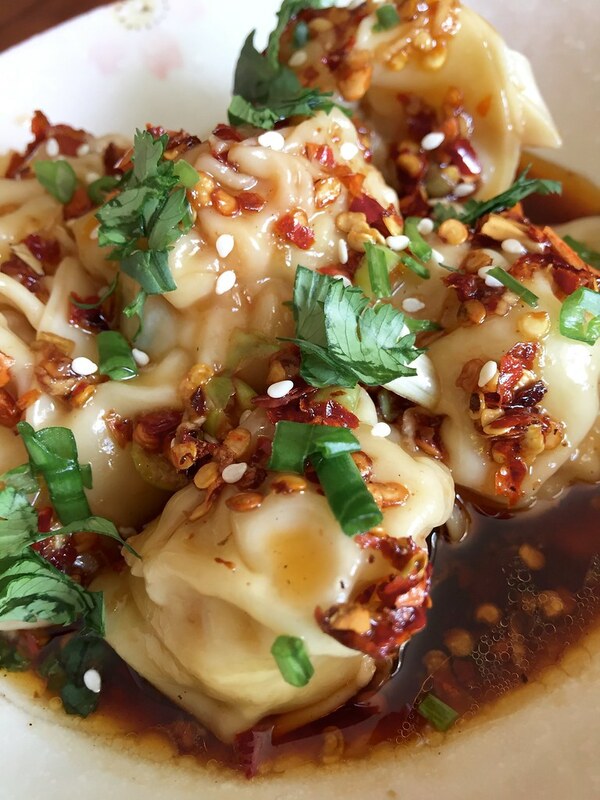 Because the co-star of this dish truly is the Chili Oil Sauce that it’s pretty much bathed in. The sauce starts off with my homemade Sichuan Chili Oil. Does it have to be homemade? Well…technically no. But it makes SUCH a difference. 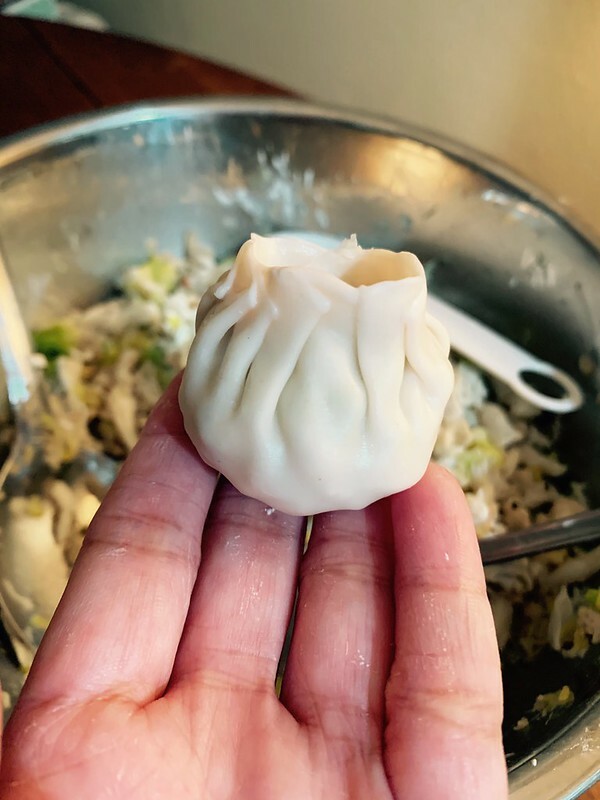 And not only is my recipe super easy but it lasts a long time in your fridge! The chili oil is then combined with soy, Chinese black vinegar (there’s really no substitute for it), sugar and a couple of other items. Simple right? That’s because the homemade oil is so aromatic that it needs very little else! 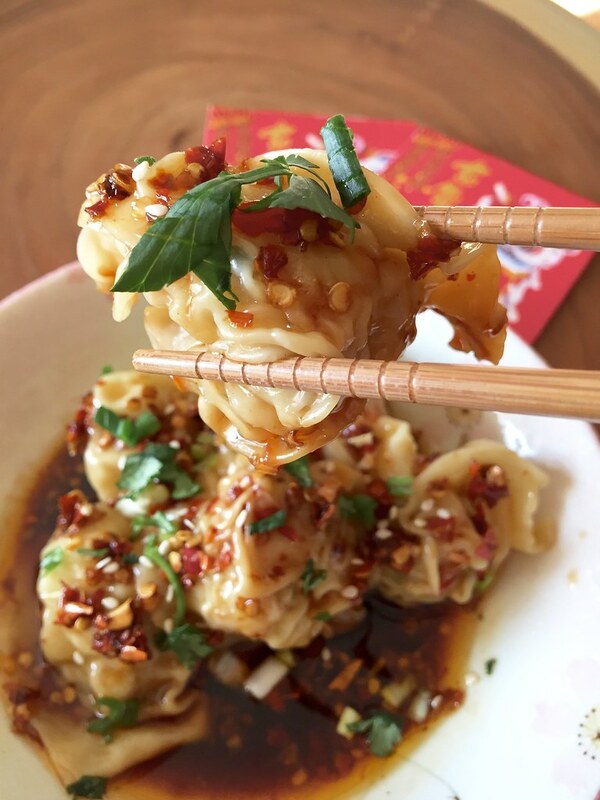 And if you’re REALLY fiery, after you’ve sauced the wontons, you can add a few extra dollops of the Sichuan Chili Oil everything. You can sure bet that I do—but perhaps dial it down a bit if you’re serving little ones. 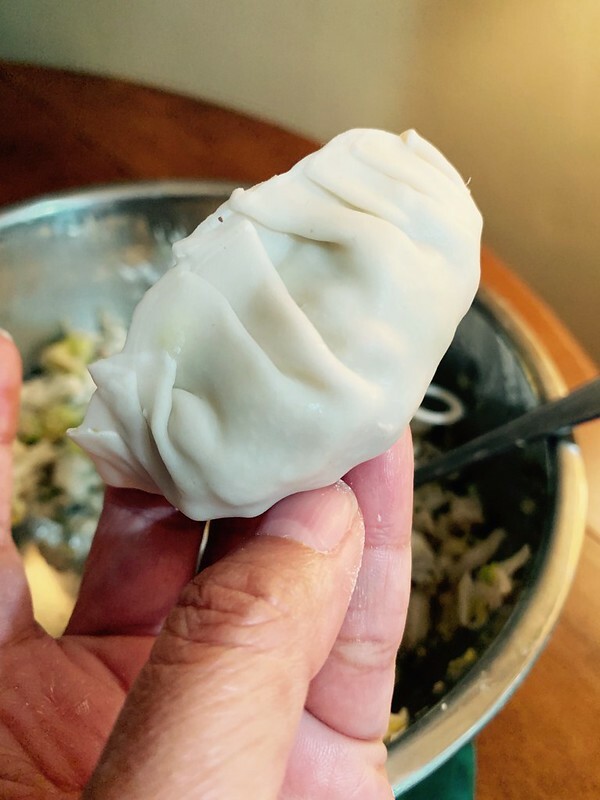 There are also several different ways to fold wontons as I’ve shown above but I generally just go for the standard “ingot” fold as I’ve described in the recipe. And with that dear friends, let Bella and I wish you all Chúc Mừng Năm Mới!!! May the Year of the Dog be filled with happiness, good health, prosperity and endless Foodventures! ps. Bella believes EVERY year is the Year of the Dog. 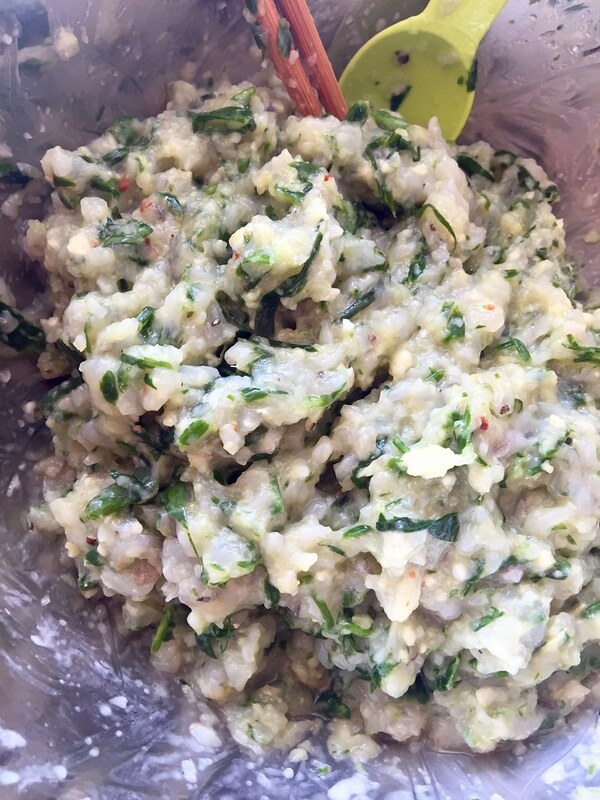 Place the scallions, ginger, cloves, shallot and cilantro in a food processor. Pulse several times until all of the ingredients have broken down and become roughly the same minced texture. Add the shrimp and pulse until everything has combined and the shrimp has turned into somewhat of a paste. Add the pork, Shaoxing wine, soy sauce, fish sauce, sesame oil, sugar and pepper. Pulse just until the ingredients have fully combined. 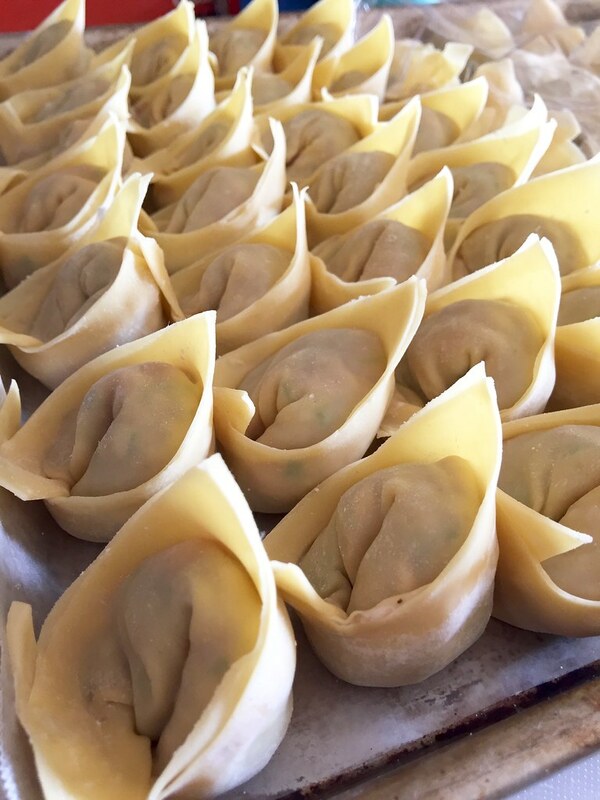 Begin assembling the wontons. 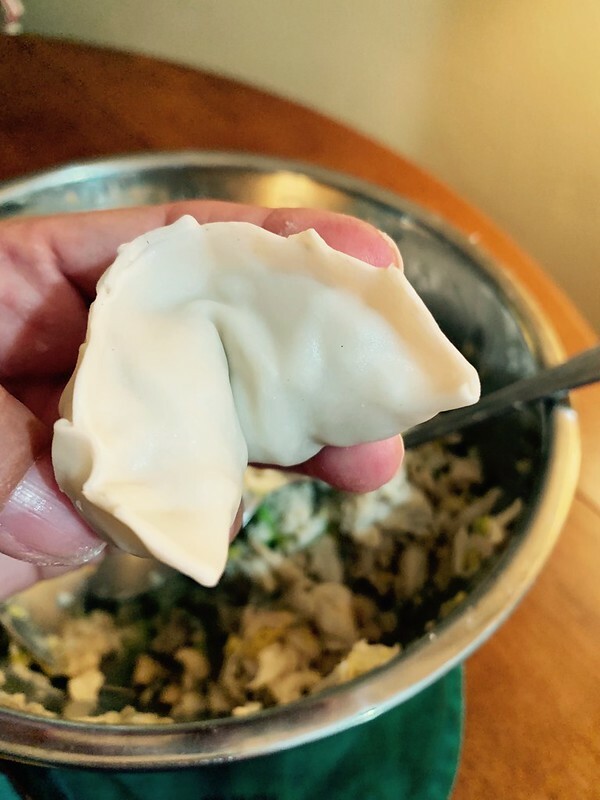 Place one wonton wrapper down on a flat surface so that it points towards you. Dip the tip of your finger into water and moisten the top two edges of the wrapper. 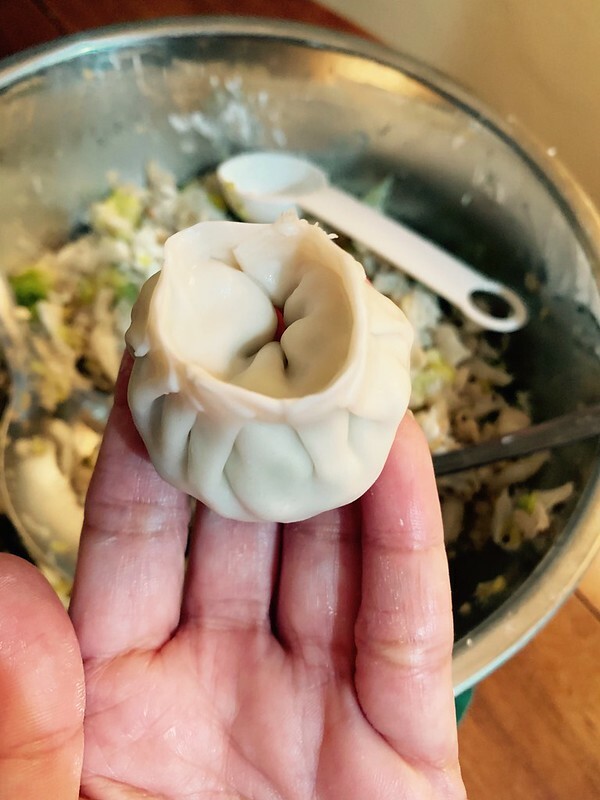 Place about 1 heaping teaspoon of the filling in the center of the wonton wrapper. Fold the bottom corner (the one nearest you) over the filling so that it meets the top point and forms a triangle. Press down to seal the edges of the triangle while pressing out any air that may have been trapped inside. Add a dab of water to the two outer corners of the triangle and fold in so that they meet. Press corners together to firmly seal. 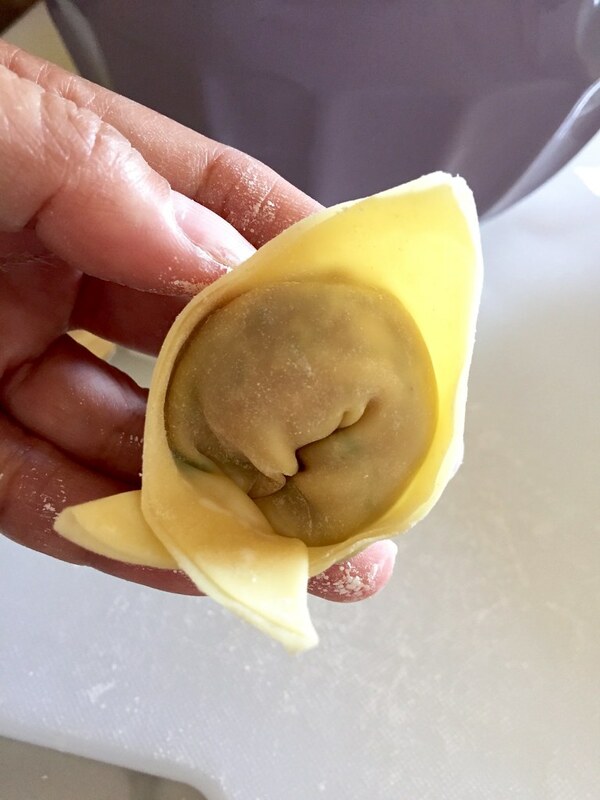 Place the wonton on a baking sheet and continue until all the filling/wrappers have been used. Prepare the sauce by whisking all the ingredients together in a bowl until the sugar has dissolved. Set aside. Bring a large pot of water to a boil. Add the wontons to the pot (no more than a dozen or so at a time) and lower the heat so that it’s at a steady but not rapid boil. Constantly stir so that they do not stick together. 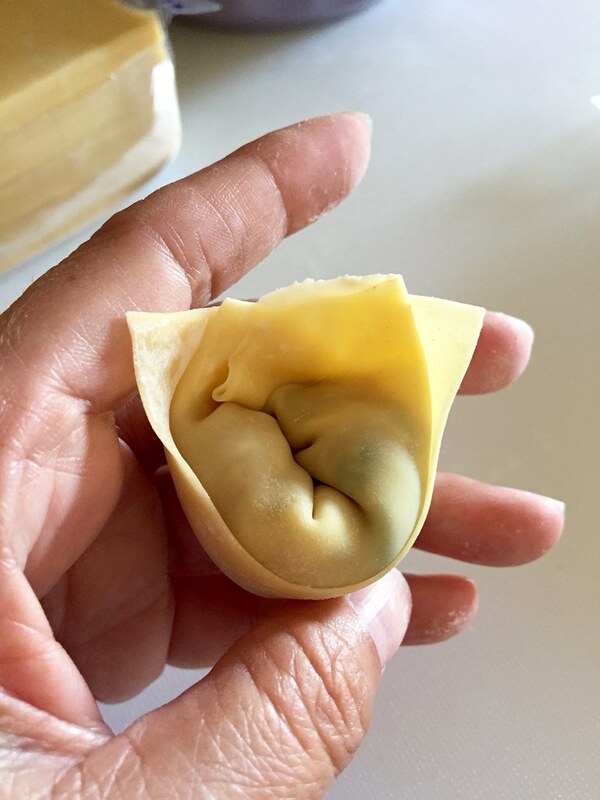 Allow the wontons to cook for about 3 minutes or until the wrappers become translucent and the filling has cooked through. 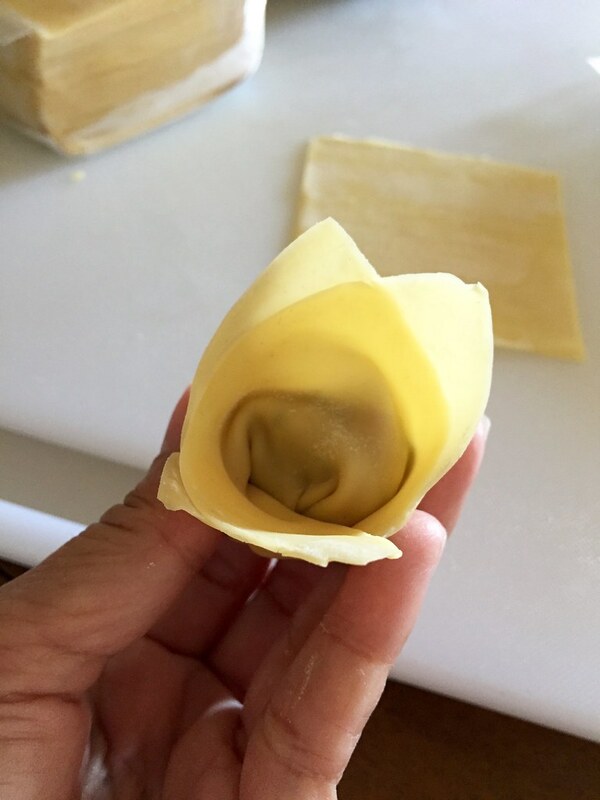 Use a large slotted spoon or kitchen spider to remove and drain the wontons. 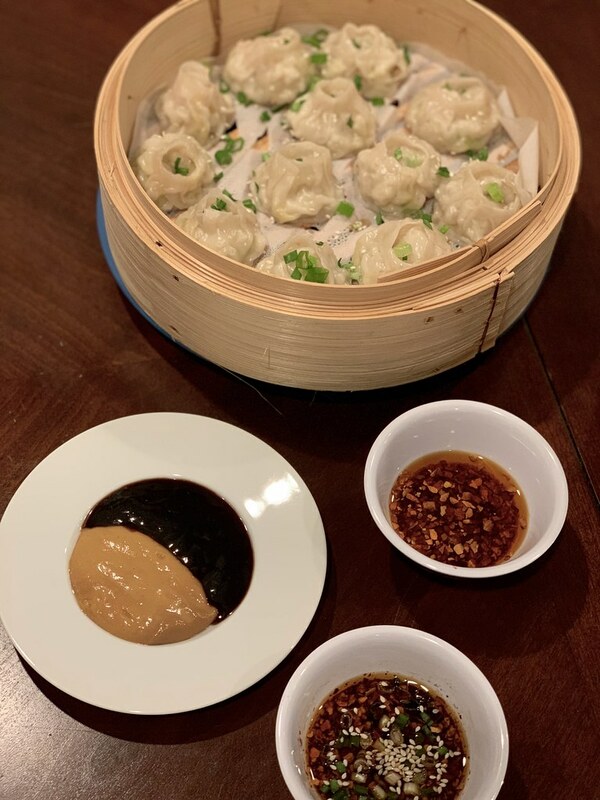 Transfer to a serving dish and spoon the sauce over the wontons. 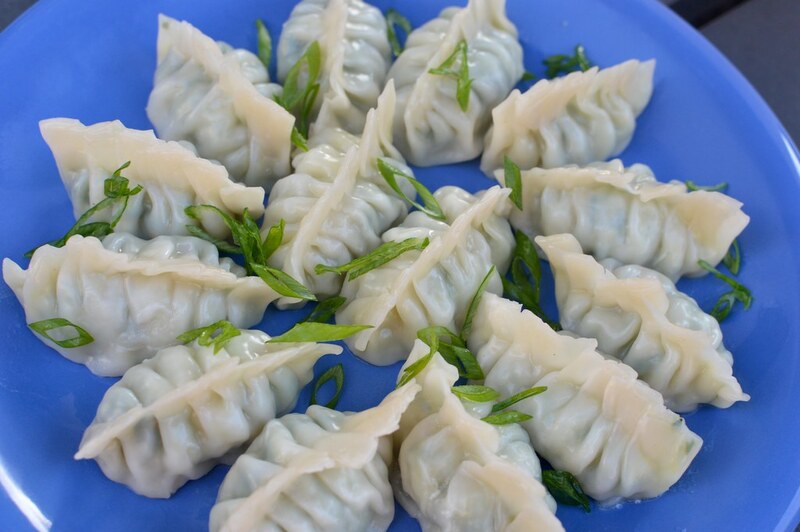 Garnish with scallions, cilantro and sesame seeds. Serve immediately. Let me tell you, Folks. 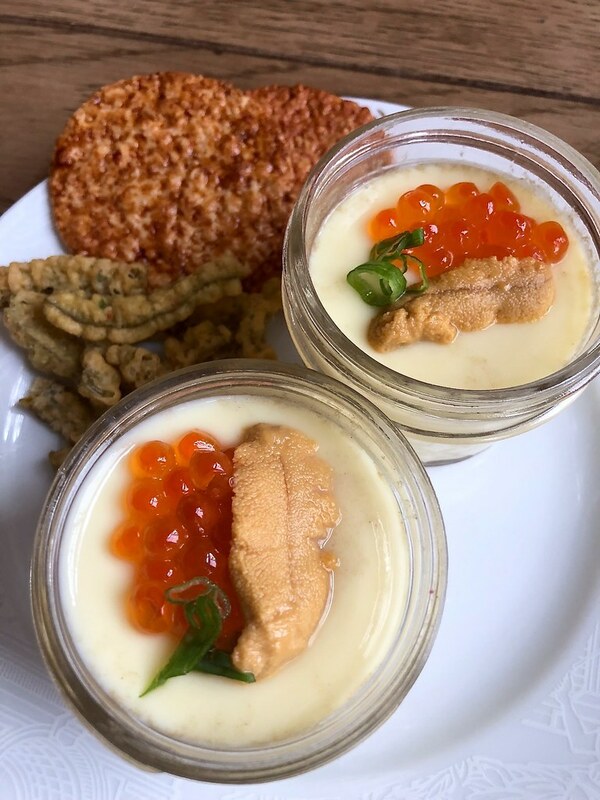 This is the kind of dish that I want to enjoy a big ol’ bowl of while sitting on my balcony …. watching the ocean waves roll onto the sand with the sun just barely setting. Oh–and of course with a fantastic chilled glass of Sancerre in hand. Only problem is–although the beach is just a short bit away, there are a bunch of pesky buildings and homes blocking my view. How inconsiderate of them, right? Oh….and I also don’t have a balcony. So instead, I’ll just sit on the living floor while diving into this scrumptious bowl of mussels and watch whichever show I’m binge-watching on Netflix at the moment. Pretty much the same right? Just splitting hairs, really. I love making mussels. They’re super easy and quick to whip up for guests or if you’re dining solo. And as far as seafood goes, they’re a great bang for your buck! 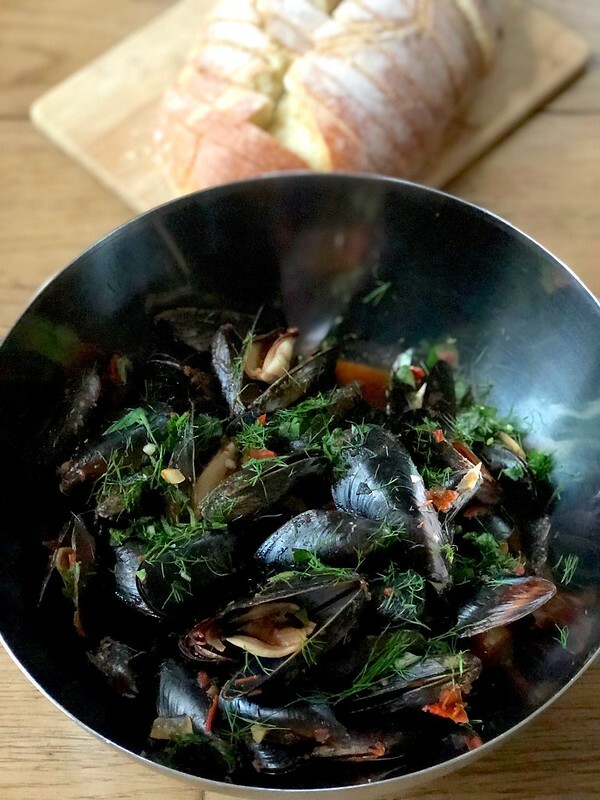 I usually make Spicy Mussels in White Wine or Belgian Beer Mussels with Frites as they’re both so low maintenance but these Tomato-Fennel Mussels really do bring such a different profile. 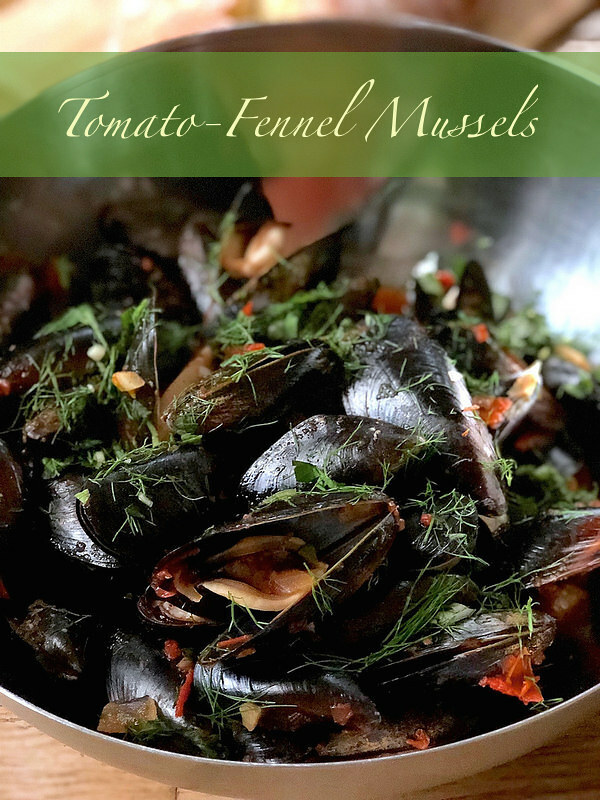 Just as easy but the addition of the fennel, crushed tomatoes and clam juice create a rich and an intensively flavorful sauce–particularly when the liquor of the mussels join the party. They smell divine while bubbling away and are perfection when you serve it with toasted baguette or ciabatta to soak up all that goodness. In fact, the sauce is thick enough (but not too thick) that it can be served over linguine or other long stranded pasta. 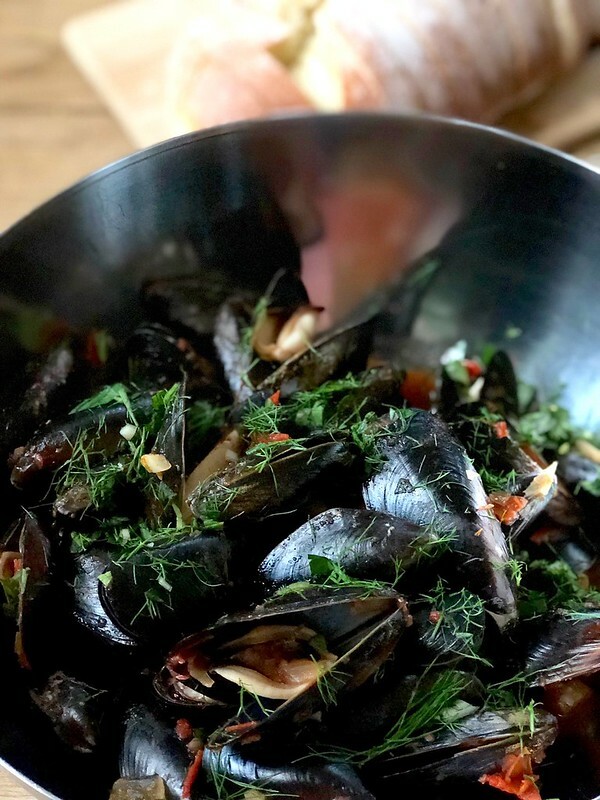 Whatever the setting you end up having these mussels at, you’re going to love them! Cut the fennel bulb from the stalk, reserving the fronds. Dice the bulb and roughly chop the fronds. Set aside separately. Heat a large, heavy bottom pot over medium heat. Add the olive oil, butter and swirl around the pot. Once the oil begins shimmering and the butter has melted, add in the onions and chopped fennel bulb. Stir and cook for 4-5 minutes until softened but not browned. Add the garlic, red pepper flakes and cook for an additional minute until fragrant. Pour in the wine and allow the liquids to come to a boil. Keep stirring until the wine nearly evaporates. Pour in the clam juice and can of crushed tomatoes with its juices. Stir in the thyme sprigs and bay leaves. Partially cover the pot and allow everything to come to a rolling boil. Reduce the heat to low and simmer the ingredients for 10-15 minutes stirring once or twice during that time. Uncover the pot and turn up the heat to medium. Once the items starting bubbling, add in the mussels. Stir a few times so that they become coated in the tomato sauce and place the lid back on the pot. Allow the mussels to steam for 5-7 minutes until they have all opened. Remove the lid, stir the mussels around a few times and taste the sauce. Add additional salt as necessary. Discard of the thyme stems and bay leaves. Fold in the fresh parsley and half of the chopped fennel fronds. Transfer the mussels and the sauce into a large serving dish. Garnish with the remaining fennel fronds and serve with warm bread. I already have a Shrimp Risotto recipe posted on the blog. And it’s wonderful, tried and true. 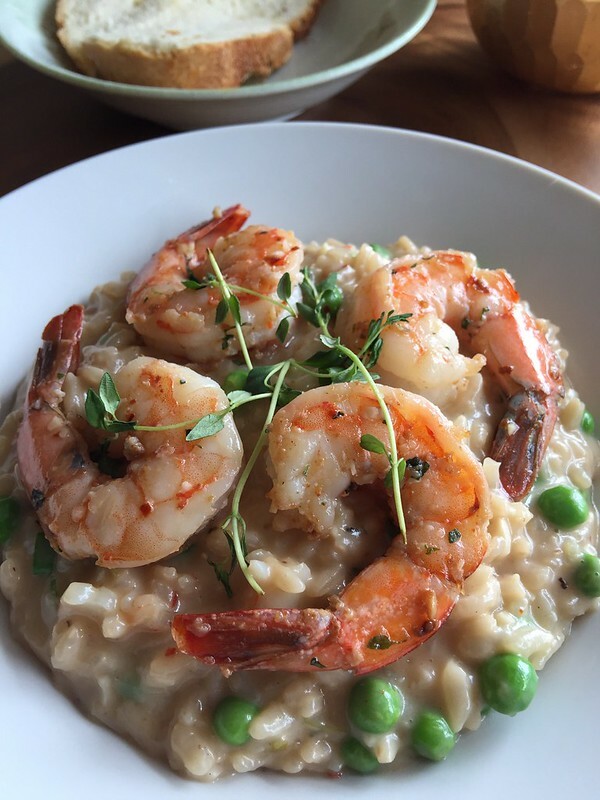 But y’all…it’s not THIS Shrimp Risotto. 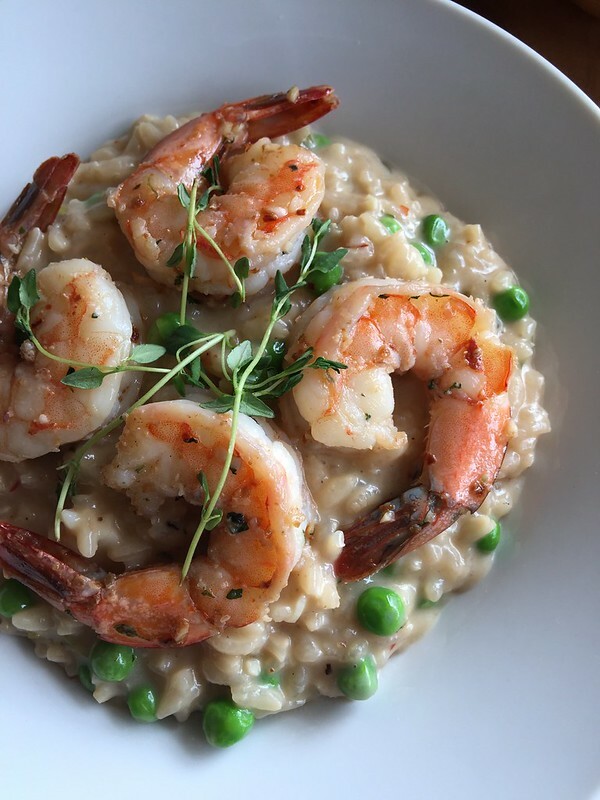 Because as much as the other one was delicious, I really kicked it up a few notches with this Creamy Risotto with Pan Seared Garlic Shrimp and Peas. Like most situations, I just can’t leave things be. I’m constantly tweaking recipes. Sometimes out of necessity because I’m missing an ingredient or two and sometimes because I just want to change things up. So what did I do different? A few things like use shallots and leeks. But the big game changer was the addition of peas and heavy cream. My usual risottos are rich and creamy just by nature of the slow cooking and constant stirring of the rice to release the starches. But this particular day, I wanted things extra decadent and added a few splashes of heavy cream at the end. And the peas added a nice punch of freshness and texture. 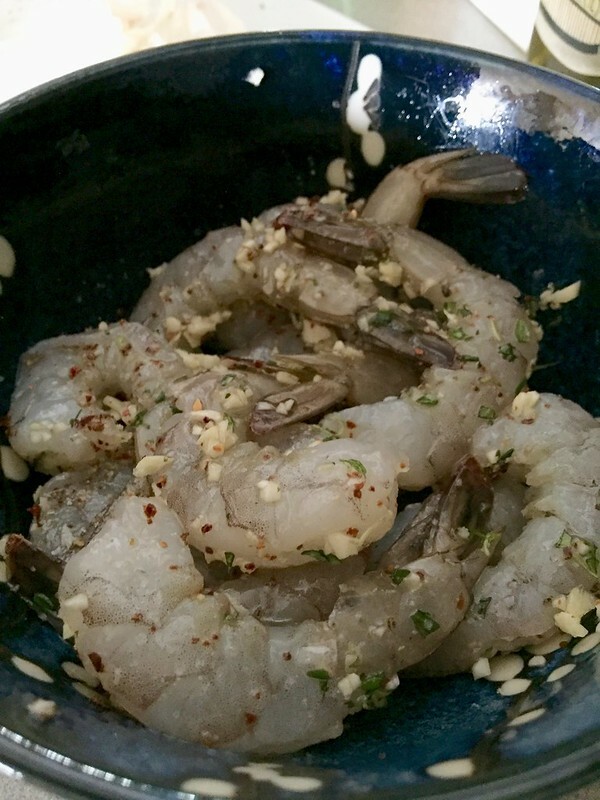 Combine the shrimp, 1 tablespoon garlic, ½ teaspoon red pepper flakes, and 1 tablespoon thyme leaves. Season with salt, pepper and place in the refrigerator covered for 30 minutes. Heat 1 tablespoon olive oil in a skillet over medium-high heat. Add the shrimp. Cook for 1-2 minutes on each side until opaque. 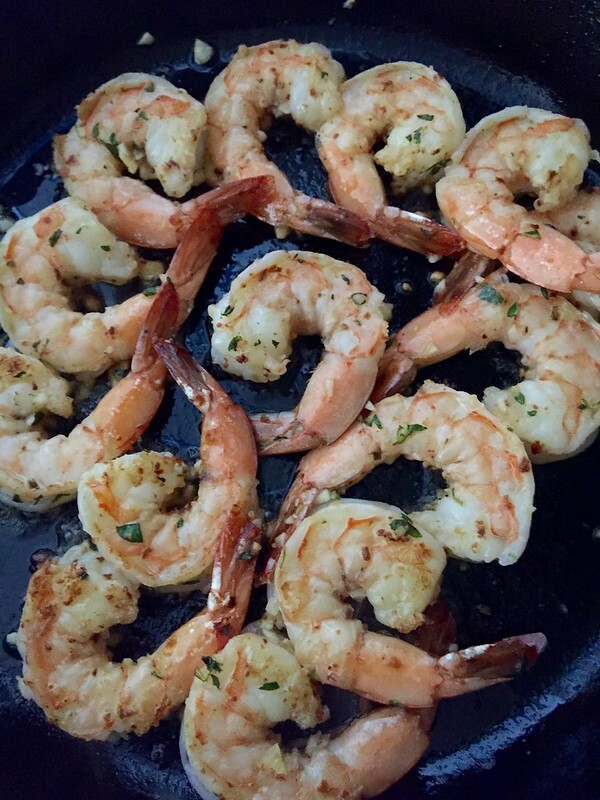 Remove the shrimp from the skillet. Chop half of the shrimp into large chunks while leaving the other whole. Cover and set aside. In a heavy bottomed pot, heat remaining olive oil and butter of medium heat. Add the shallots, leeks and cook until tender and translucent. While the aromatics cook, place the stock in saucepan and bring to a low simmer. Keep the stock simmering on the back of the stove. 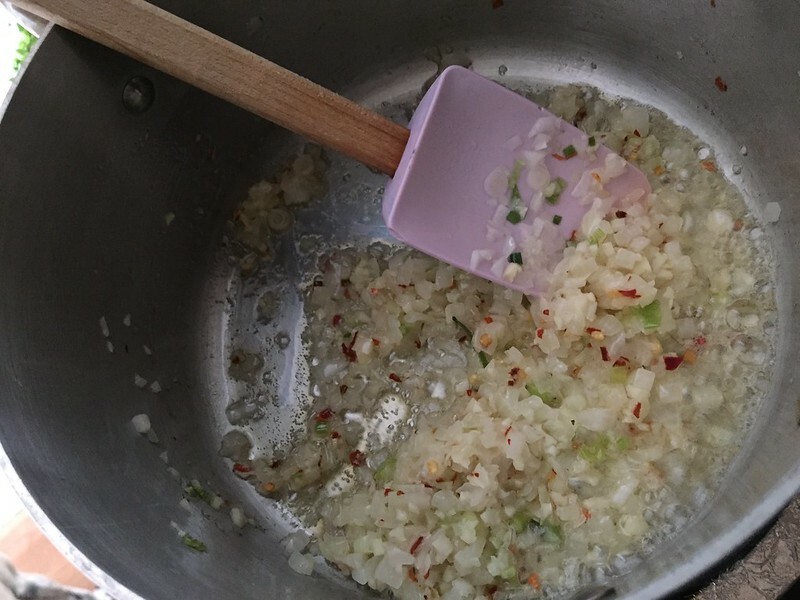 Once the shallots and leeks have cooked for 5-6 minutes, add in the remaining garlic, red pepper flakes and thyme. Cook for 1-2 minutes and add the rice and stir until it is well-coated and opaque. The rice may begin to slightly crackle as it lightly toasts. Pour in the wine and stir until it has nearly evaporated. Ladle in about 1 cup of the heated stock. Cook and continue stirring the rice until it has nearly absorbed all the liquid. Add the remaining stock, about 1 cup at a time—stirring well in between each addition. 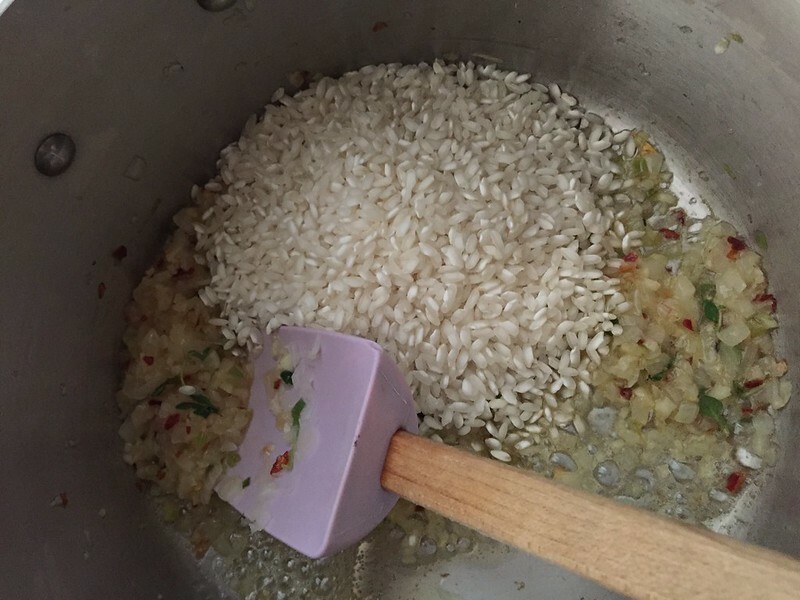 Take care to allow the rice to absorb each addition of stock before adding more. You may not need all 5 cups as the risotto should be slightly firm and creamy once done. This process takes approximately 25 minutes. 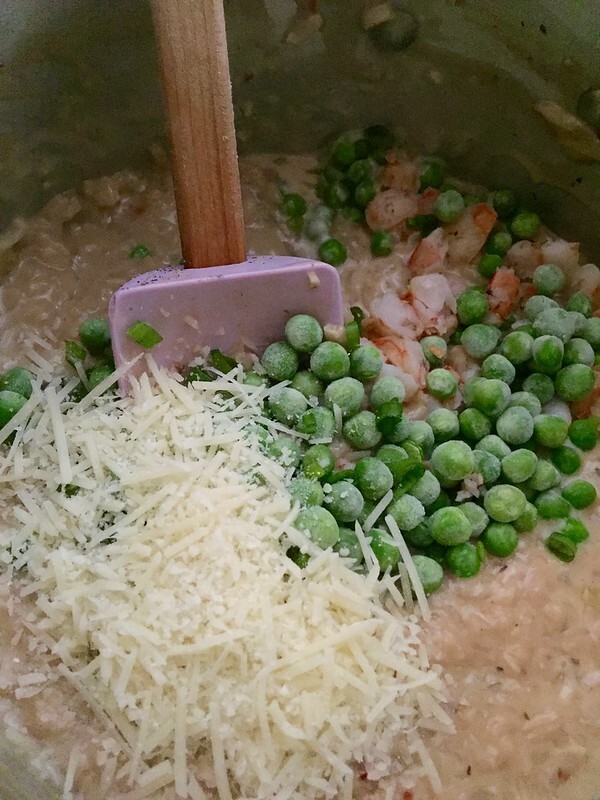 When the risotto is done, pull it off the heat and stir in the heavy cream, chopped shrimp, peas and Parmesan cheese until fully incorporated. Taste and adjust with additional salt and pepper as needed. 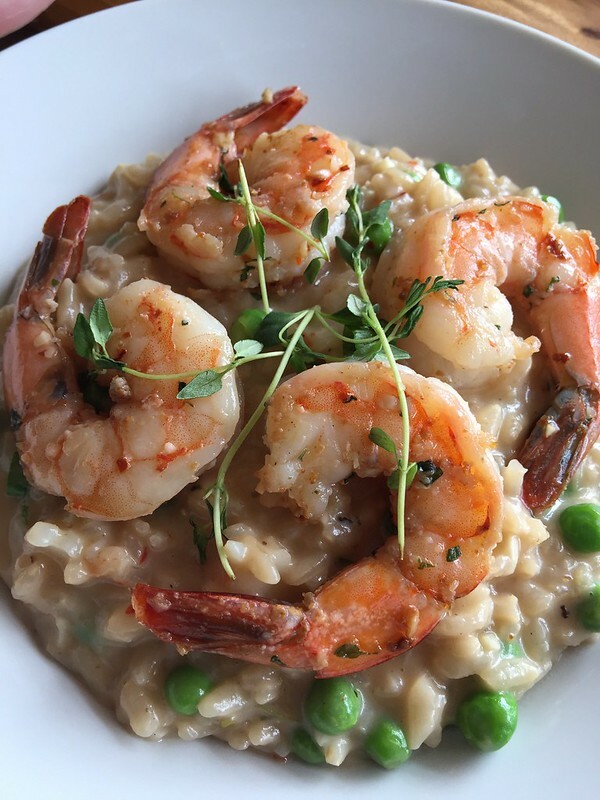 Plate each dish with a portion of the risotto topped with the remaining whole shrimp and additional thyme. Serve immediately. 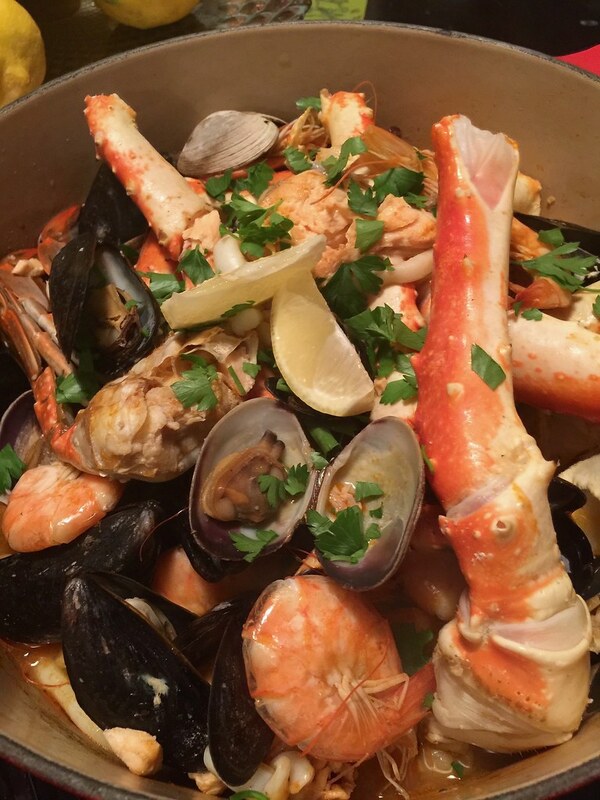 Our Seafood Cioppino – Happy Birthday Mom!!! 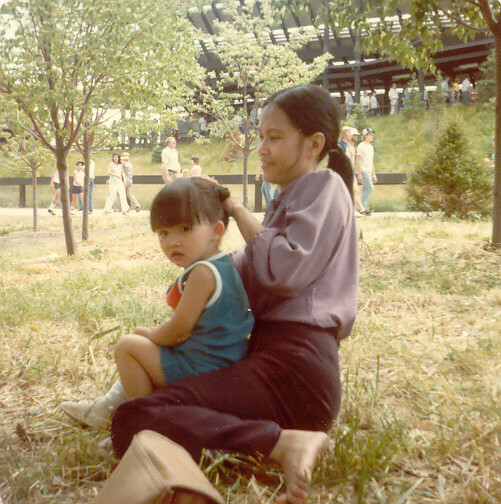 Today is our Mama’s birthday and although it’s been 10 years since she’s been with us, not a day goes by when we don’t miss or think of her. The affinity to talk to strangers and win them over in minutes…. 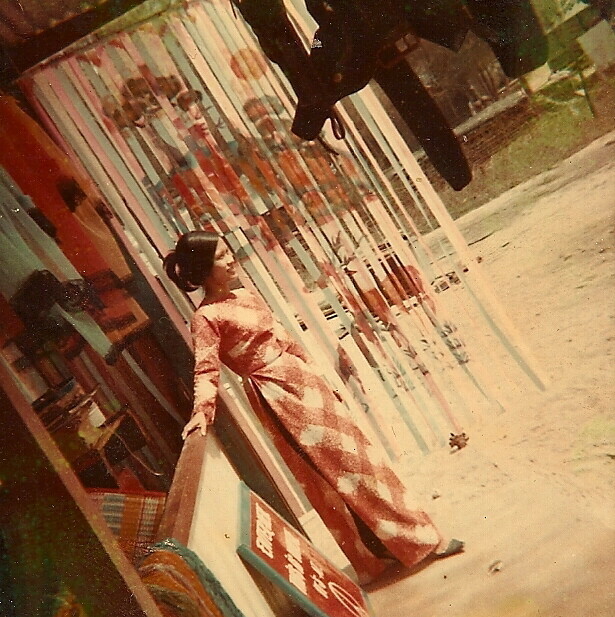 That strong “will” (yes…I was trying not to say stubborn)…..
And that love to cook and explore new cuisines. 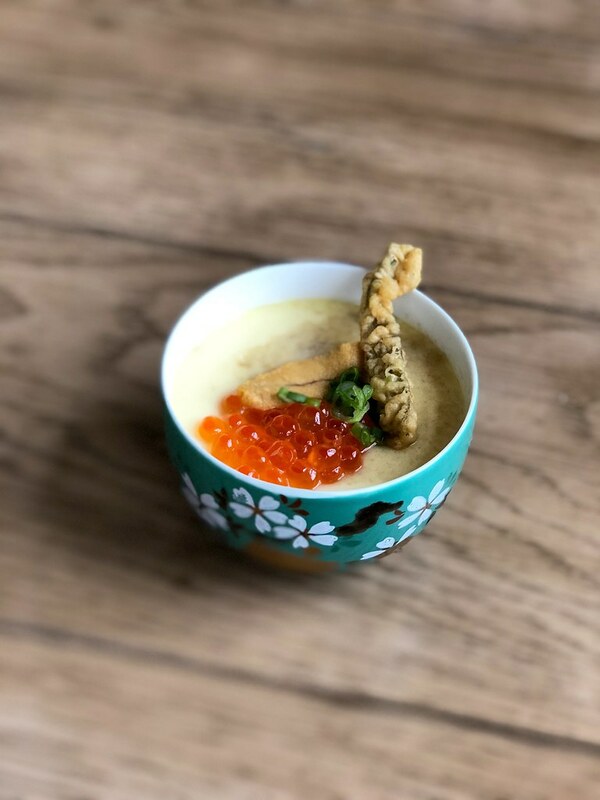 Of course there are dishes that I cannot help but miss her dearly when I make them. 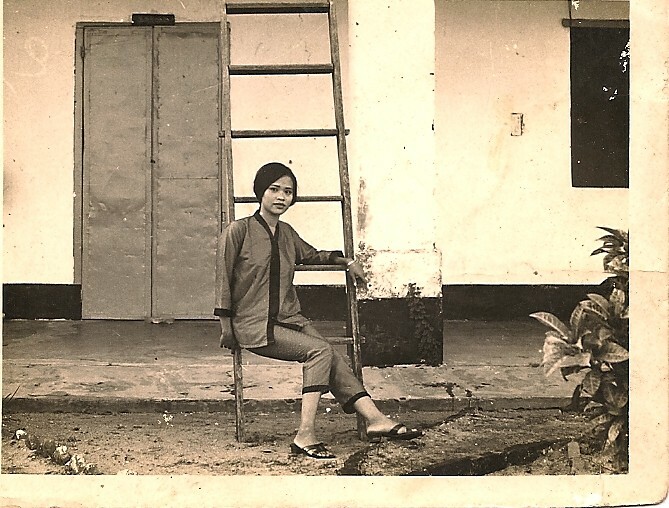 Like Thịt Kho Trứng (Vietnamese Caramelized Pork and Eggs), Thịt Bò Xào (Stir-fried beef), Mì Quảng (Turmeric Noodles) or even Korean Chap Chae —all dishes I used to ask her to make for me. 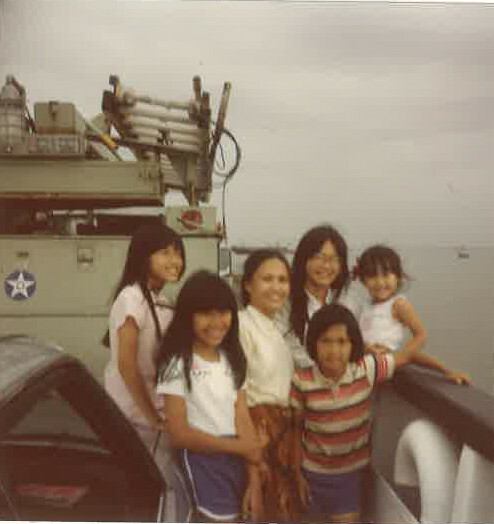 But then there are dishes like Seafood Cioppino, that although wasn’t her own, has now become a staple among my siblings every time we want to celebrate Mom. 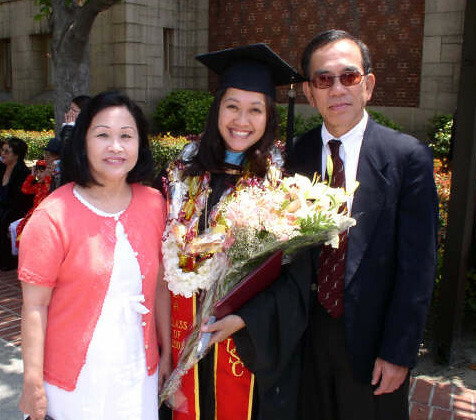 At least a dozen years ago when I lived in San Jose, Mom came to visit me and sister P who lived in San Francisco. We spent the time walking around the city, shopping, and eating everything possible. 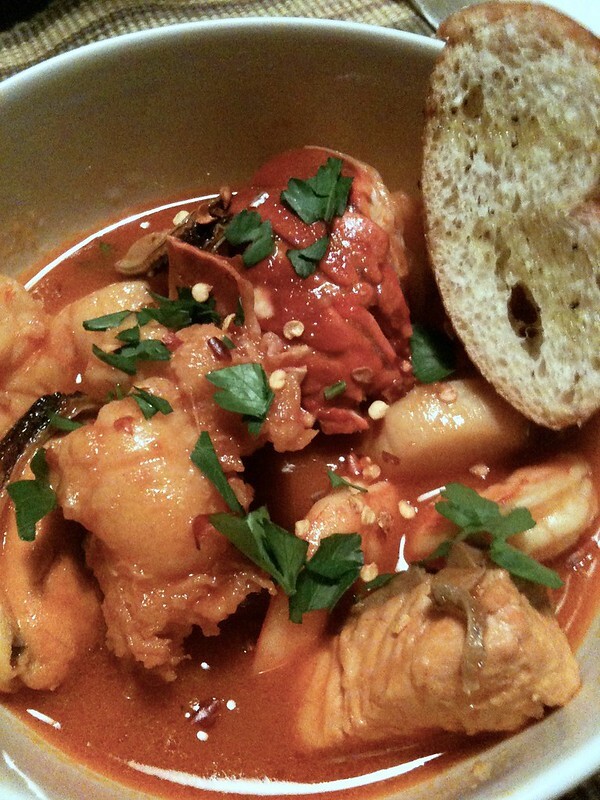 And one night for dinner, P and I decided to make her a decadent, quintessential San Franciscan dish–Seafood Cioppino. Cioppino is a seafood stew that originated in the Italian American communities of SF. It layers tons of aromatics with wine and tomatoes to make a fragrant stock. 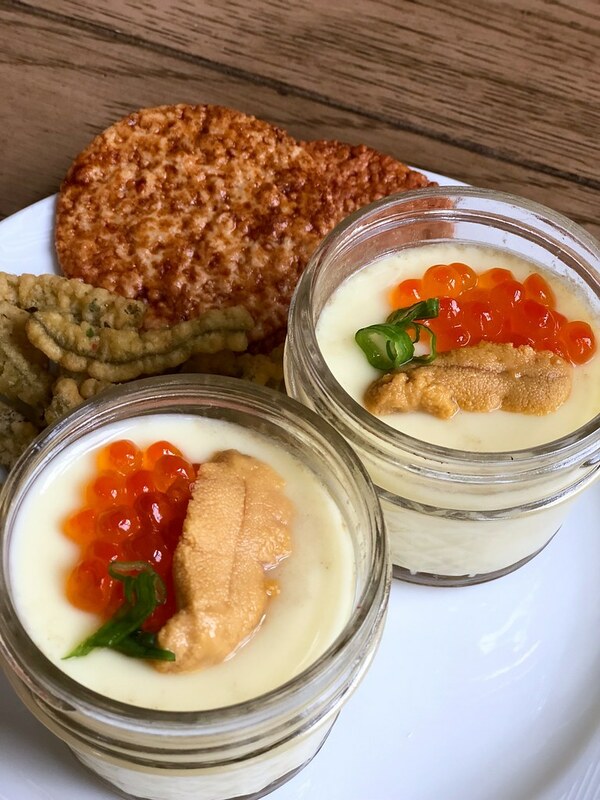 A variety of seafood is then cooked in the stock –which then deepens in flavor from the juices of the shellfish and seafood. It’s incredible and we knew Mom would love it. 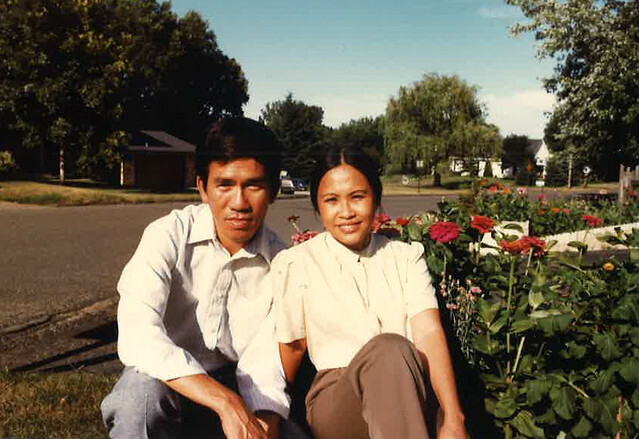 While P and I spent hours in the kitchen that late afternoon charring the peppers, sauteing the veggies, simmering the stock, and cleaning all the seafood we had scored on Clement Street, Mom sat at the table watching us. She kept asking what we were doing—-and then, what we were going to next. Then she would say that we were going to a lot of trouble just for one dish. But honestly, I think of everything we did during that visit, she loved that day the most. Chatting with her daughters while they cooked and fussed over her. Of course, she loved the Seafood Cioppino too! And can we just say how fabulous Mama was sitting in her satin pajamas, wearing her black Tahitian pearls while digging into a big ol’ bowl of Seafood Cioppino?? 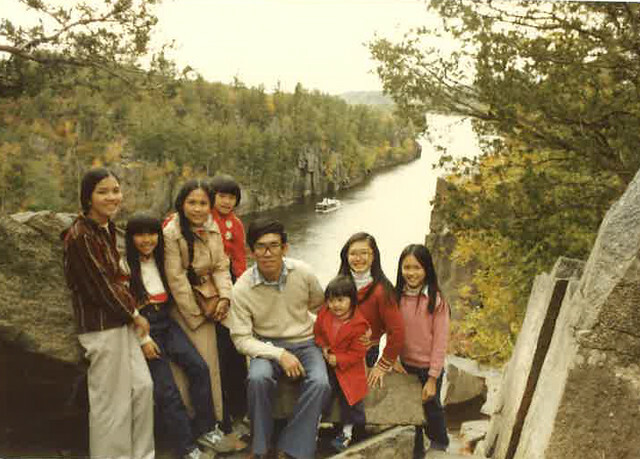 Shortly after Mom passed, I made a photobook for my family that included old pictures and our favorite recipes from her. And soon after, that one dish P and I made that one SF visit became “Mom’s Cioppino”—something that is lovingly made many times a year since. 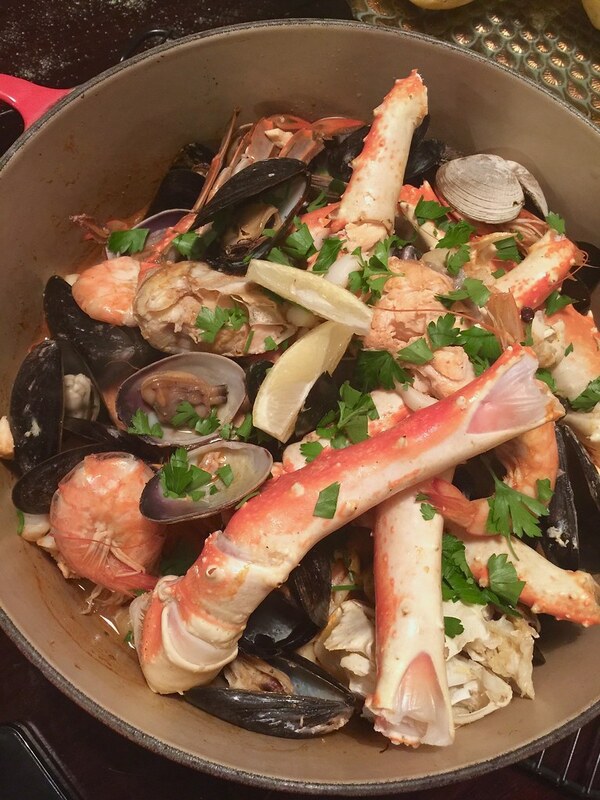 I’ve posted tons of pics on Instagram and Facebook of our Seafood Cioppino and often get requests for the recipe. Whether it was too personal or maybe it was still too “soon”–I just wasn’t willing to share it yet. 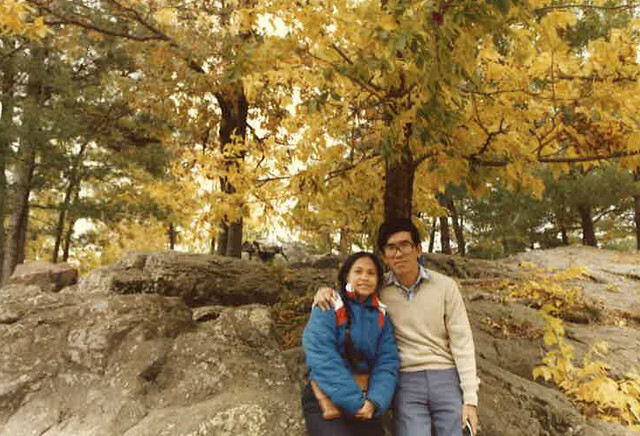 After all of the years, it doesn’t get “easier” and I still miss her so much. But these days, I am able to share more things about her and now it’s rather perfect to share with you all this dish on her birthday. Yes, there are many steps with the Cioppino and it does take some time —but the good news is, nothing is really difficult. 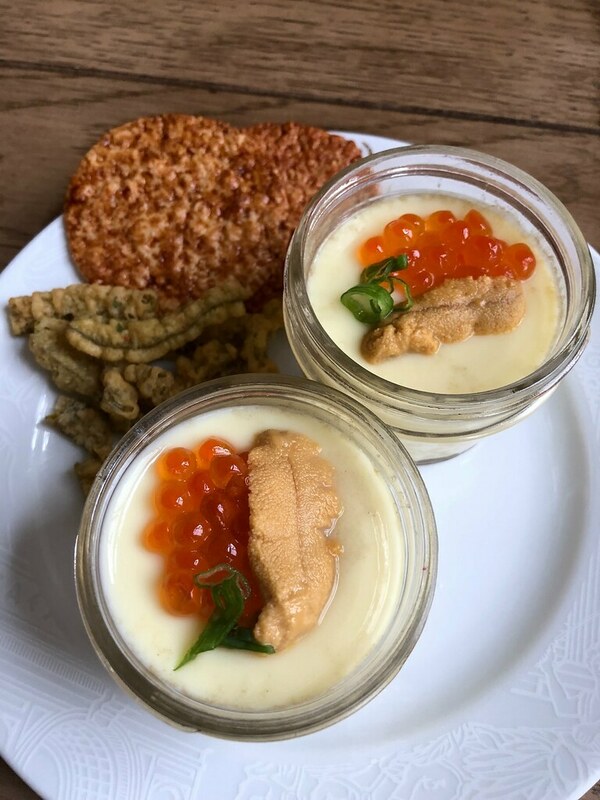 And it’s the perfect dish to share with your loved ones when you can spend the day together in the kitchen making memories. Turn your oven broiler on. Place bell peppers, jalapenos and Roma tomatoes on a rimmed baking sheet and coat with olive oil. Broil the vegetables for 5-7 minutes, using tongs to rotate frequently until the peppers have charred and the skin has bubbled. Transfer the vegetables to a large bowl and cover securely with plastic wrap. Set aside for 20 minutes to allow the vegetables to steam. Peel the skins off the peppers and discard along with the stems and seeds. Next, peel and discard the skins of the Roma tomatoes. Place a large stock pot or dutch oven over medium heat on the stove. Add 2 tablespoons olive oil and allow the oil to begin to slightly shimmer. 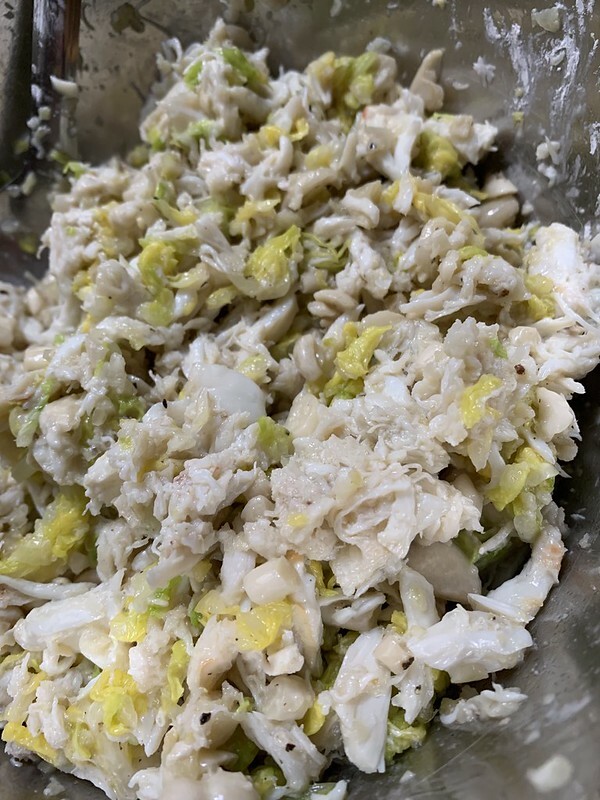 Add the onions, celery and fennel inside the pot and cook until they have softened and become translucent—you do not want them to brown. Add the garlic, red pepper flakes and cook for an additional minute until fragrant. Pour in the wine and allow the liquids to come to a boil. Add the roasted peppers, Roma tomatoes, chopped fresh tomatoes, clam juice and tomato juice. Add the thyme, parley, tarragon, bay leaf, ½ tablespoon sea salt and peppercorns. Allow the liquids to come a rolling boil, lower heat and simmer, partially covered for 1½-2 hours. The liquids will nearly have reduced by half. Pass the stock to a fine strainer and discard the vegetables and aromatics. Pour the stock into a large clean pot, add the saffron threads and lower the heat to a simmer for several minutes to allow the saffron to bloom and flavor the stock. Taste the broth and add additional sea salt as needed. Bring the stock back to a boil and add in the crab and lobster—cover and cook until the shells have become pink and the flesh becomes almost fully opaque. Stir in the clams, mussels and cover the pot. 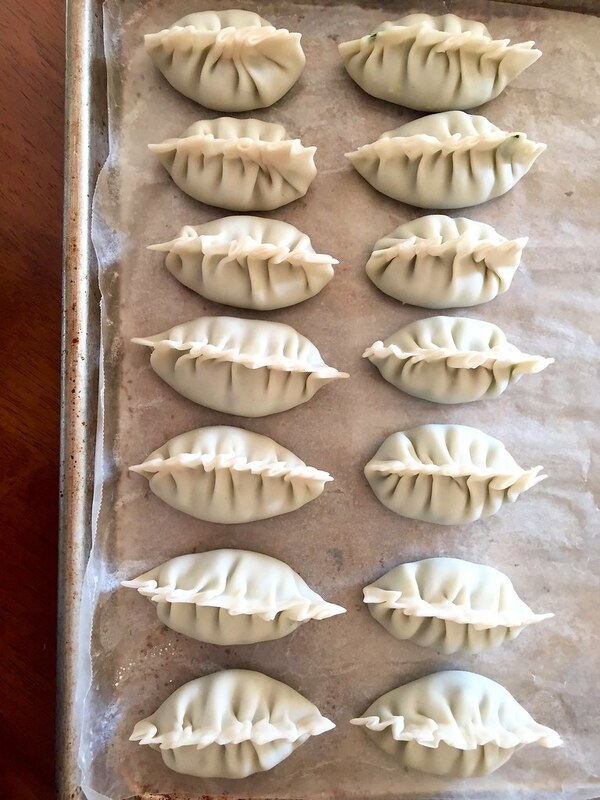 Allow them to cook for about 2 minutes until they just begin to open. 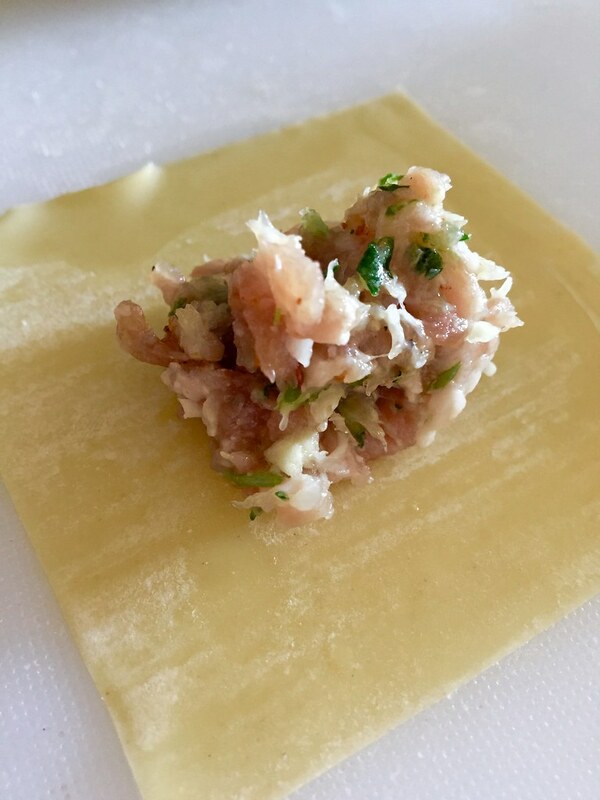 Gently stir in the shrimp, fish, calamari and allow them to cook over a simmering heat—avoid cooking the fish in a rapid boil as they will get tough. 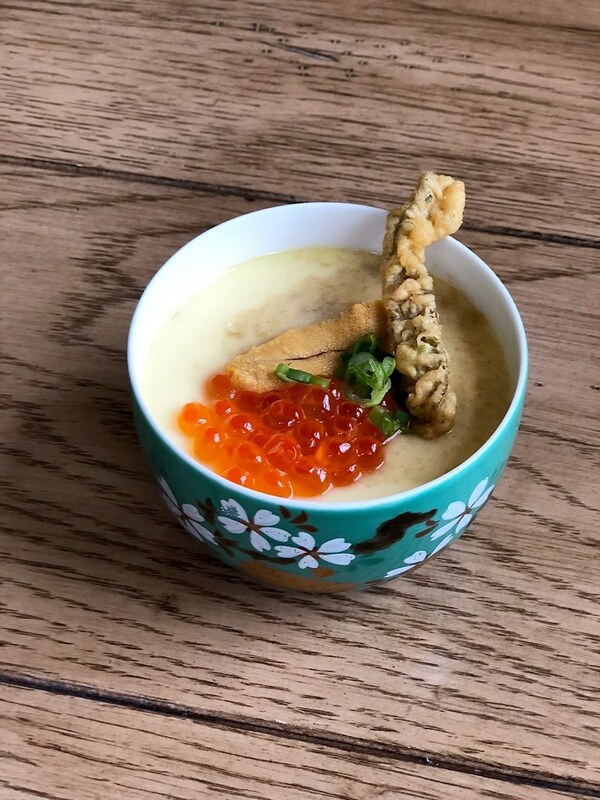 Once the last seafood items turn opaque, taste the broth again and adjust with additional sea salt and pepper as needed. Ladle the seafood into a bowl and pour the hot broth over it. Sprinkle with chopped fennel fronds, chopped parsley and serve immediately with warm bread. 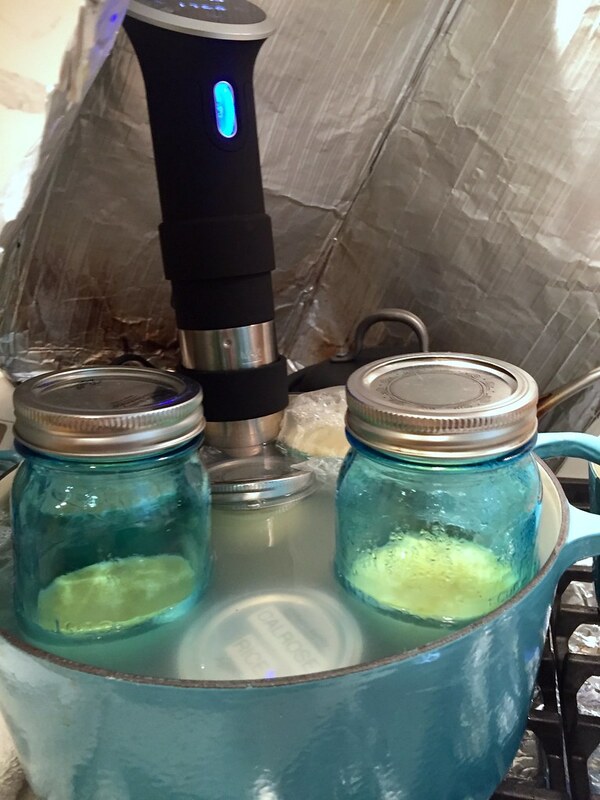 Note: This stock can definitely be made ahead of time so double or triple the batch and keep some in your freezer for a chilly night!